The latest must-visit venue in Hull’s Fruit Market has made a festive debut. Johnsons wine bar, bistro and deli is introducing itself to customers with a pre-Christmas opening ahead of a full launch in the New Year and adds to the growing reputation of Hull’s waterfront district as a culinary hotspot. It follows an extensive programme to restore a previously derelict two-storey building in Humber Street, in the heart of the Fruit Market, and transform it into the regenerated quarter’s newest venue. 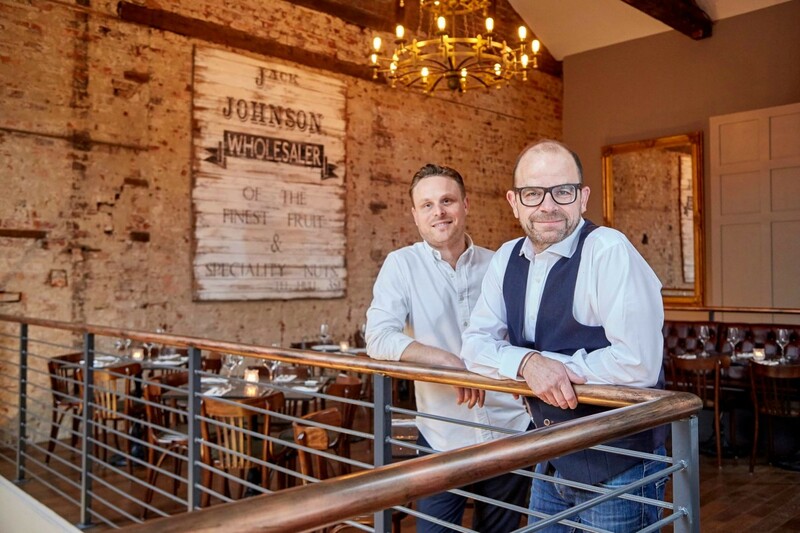 J.Johnsons is the latest venture from business partners Chris Eastaugh, Jason Gittens and Dan Robinson, owners of the successful Butler Whites restaurant in Humber Street and popular Larkin’s gastro pub in Newland Avenue, Hull. 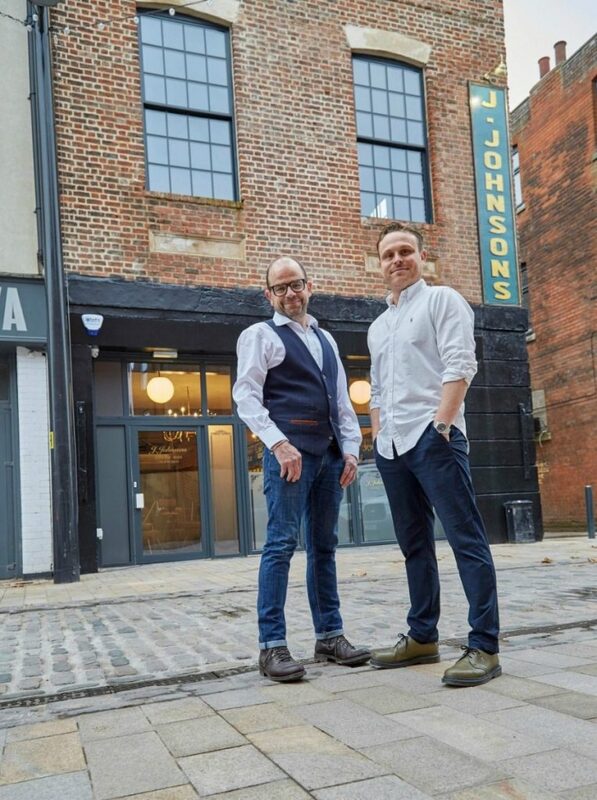 Business partners Chris Eastaugh, left, and Jason Gittens outside the latest venue in Hull’s Fruit Market, J. Johnsons wine bar, bistro and deli. J.Johnsons is named after the late Jack Johnson, a legendary figure from when the Fruit Market was the centre of Hull’s wholesale fruit and veg trade. With seating for 76 diners in total, the opening of the 1,800 sq ft venue has created 25 jobs. Mr Gittens said: “We’ve decided to have an extended soft launch for J. Johnsons, so people can pay us a visit and enjoy the food, drinks, service and ambience before we launch in earnest. “The run up to Christmas is such a busy time for us, so our chefs will be serving our current Butler Whites menu until we launch J. Johnsons’ own menu in January. Mr Eastaugh said: “We love the area and we felt this was the perfect place to create a venue that complements Butler Whites and others in the area. 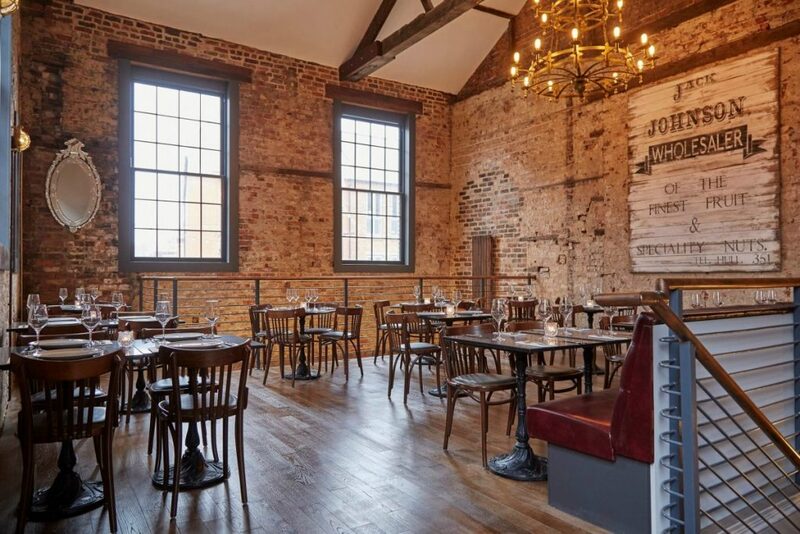 The first-floor bistro at J. Johnsons which has been created by the comprehensive restoration of a previously derelict fruit and veg warehouse. The Fruit Market is enjoying an ongoing wave of investment being driven forward by Wykeland Beal, the regeneration company formed by commercial developer Wykeland Group and housebuilder Beal Homes, as part of the Fruit Market LLP joint venture with Hull City Council. The rejuvenation of the waterfront district has stimulated the growth of a community of independent creative businesses, galleries, retailers, restaurants and bars, with more openings due after Christmas. Tom Watson, Development Surveyor at Wykeland, speaking on behalf of Wykeland Beal, said: “We’re delighted J. Johnsons has opened and another previously crumbling building has been brought back to life. It was very close to the point of no return. “Butler Whites was the first of the new wave of businesses in the Humber Street more than two years ago and it’s great that the restaurant has done so well the owners are opening a complementary venue along the street.